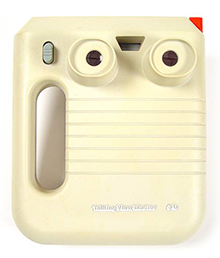 In 1984, GAF revamped the Talking View-Master to include ports for a headphone jack and AC adapter. Buoyed by the success of its View-Master, GAF released an audio-enabled variant of the 3D stereoscopic picture viewer in 1969-70. The Talking View-Master was powered by two C-batteries and contained other internal components, like a speaker, that made it roughly 3X the size of its audio-free counterpart. To play audio while showing images, the toy included specially constructed photo reels with clear plastic records attached to them. GAF sold 3-reel sets separately on topics ranging from classic fairy tales to cartoons and vacation destinations. Each set was packaged in plastic trays and included an order form and a slip-on cover that depicted stills from the set. 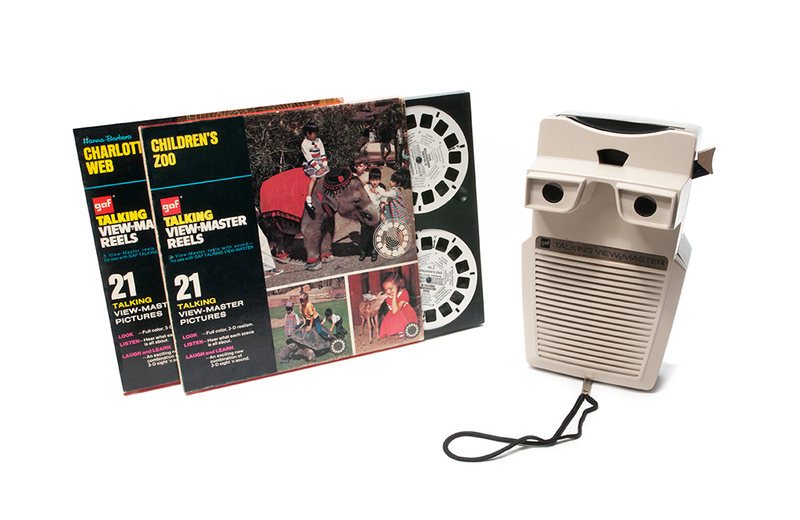 Once a reel was inserted into the Talking View-Master, users could move from photo to photo using the toy’s scene change lever and listen to the accompanying 10 to 20-second soundbite by pressing the large Sound Bar button at the front of the toy. The quality was uneven at best, often changing speeds and distorting without warning. Improving on the audio fidelity, GAF released an improved Electronic/Lighted Stereo Talking View-Master with some new bells and whistles, including internal lighting, better acoustics, and volume control. In 1984, the toy was again revamped to include additional ports for a headphone jack and AC adapter – and an entirely new form factor. The combo photo/audio reels were also replaced with a new cartridge system. Finally, in 1997, Tyco (which had acquired View-Master in 1989) released a new version that operated on two AA batteries, had a continuous reel of film, and stored audio on an embedded microchip. Bandai is re-birthing the Tamagotchi! The 20th-anniversary edition is meant to spark nostalgia in the kids of Gen Xers and teach a new generation of children the joys of responsible parenting. It's Halloween, making it a perfect time to take a look at one of my all-time favourite classic board games with a spooky theme – Which Witch?